Reagent exhibits at least 85% transfection efficiency of siRNA delivery. Transfection efficiency was determined by qRT-PCR. According to Nature, pancreatic cancer has a 5-year survival rate of 5%, making the quest for a reliable cure urgent. Pancreatic ductal adenocarcinoma is the fourth primary cause of cancer-related fatalities, comprising nearly 90% of all pancreatic malignancies. PANC-1 is a well characterized and extensively studied cell line that is frequently employed as in vitro model for pancreatic ductal adenocarcinoma research. The PANC-1 cell line plays an essential role in pancreatic cancer therapeutic assays. The PANC-1 cell line was established from pancreatic duct tissue of a 56-year-old Caucasian male with epithelioid carcinoma. PANC is short for pancreas, referring to the Human pancreas, where cancer can be found. 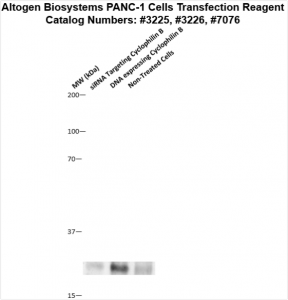 Also, the PANC-1 cell line serves as a suitable transfection host. The growth of these cells is inhibited by L-asparaginase. PANC-1 cells are used as an in vitro model of non-endocrine pancreatic cancer for tumorigenicity studies. These cells possess the type B phenotype for glucose-6-phosphate dehydrogenase G6PD and overexpress heregulin/human epidermal growth factor receptor 2 (HER2/neu) oncogene, which is present in 60 to 70% of human pancreatic carcinomas but are estrogen receptor (ER) negative. PANC cells have been shown to be negative for MUC4 and positive for Smad4, a TGF beta signaling cascade protein inactivated in human gastrointestinal cancers. PANC can be induced to differentiate into hormone-producing islet-like clusters following stimulation by the FGF2 growth factor. The PANC-1 cell line has an estimated doubling time of 52 hours with a modal chromosome number of 63. Also, these cells have Glucose-6-phosphate dehydrogenase activity of the slow mobility of B type. Altogen Biosystems provides proprietary cationic liposome formulation that demonstrate high efficacy transfection of PANC-1 cells. Transfection kit is preoptimized for the intracellular delivery of plasmid DNA, siRNA, and mRNA molecules into PANC-1 non-endocrine pancreatic cancer cell line. Figure 1. Cyclophilin B silencing efficiency was determined by qRT-PCR in the PANC-1 cells transfected by Cyclophilin B siRNA or non-silencing siRNA control following the recommended transfection protocol. Cyclophilin mRNA expression levels were measured 48 hours post-transfection. 18S rRNA levels were used to normalize the Cyclophilin B data. Values are normalized to untreated sample. Data are presented as means ± SD (n=3). Figure 2. Protein expression of Cyclophilin B in PANC-1 cells. DNA plasmid expressing Cyclophilin B or siRNA targeting Cyclophilin B were transfected into PANC-1 cells following Altogen Biosystems transfection protocol. At 72 hours post-transfection the cells were analyzed by Western Blot for protein expression levels (normalized by total protein, 10 µg of total protein loaded per each well). Untreated cells used as a negative control. Altogen Biosystems provides preoptimized transfection products for life science research applications. Transfection protocols are optimized for individual cancer cell lines. Altogen Biosystems developed two types of in vivo delivery kits for animal research: Tissue-targeted reagents (delivery to liver, pancreas, and kidney tissues), and broad range in vivo delivery reagents (PEG-Liposome, Nanoparticle-based, Lipid-based, and Polymer-based kits). Advanced formulation of reagents and optimized transfection protocols provide efficient intracellular delivery of proteins, DNA, RNA, and any other negatively charged molecules in vitro and in vivo. Read more about transfection technology at Altogen’s Transfection Resource.